Picnic tables bring thoughts of warm weather and sunshine. As we say goodbye to the colder winter months, what better way to say hello to the unfolding warm season than by breaking bread outside with friends and co-workers? Whether young, old or somewhere in between, a picnic table is a visual and physical means of saying to someone, sit, enjoy and eat. Picnic tables in daycare settings are simply a fun way for children to eat lunch or have a snack during playtime. Youngsters love eating outside and wiggling on a bench with friends. And for teachers, eating outside means less clean up afterwards. The crumbs from all those sandwiches can fall right onto the grass. No one will have to sweep up the floor. Look for picnic tables specifically designed for kids that have lower bench seat heights. 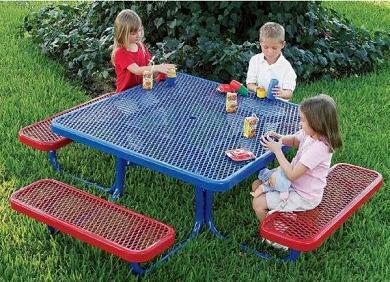 The Mighty Tuff Kids Picnic Tables come in kid-friendly 12” bench sizes and have smooth, rolled edges for safety. This table is built “Tuff” for outdoor use and has weather-resistant UV coating for long-lasting commercial use. Mix and match the top and bench colors for an extra fun finished product. Picnic tables placed in school settings are perfect for socializing during the most communal time of a student’s day, lunch time. 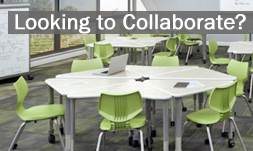 Students can join each other easily on benches. No need to worry about loose chairs being left outside that could be blow around during bad weather, or worse, stolen. Add picnic tables to shaded areas of your campus and look for your school colors to add a bit of school spirit to our scholastic landscape. And just how do you keep outside furniture such as picnic tables secure from theft? Most picnic tables are available with various leg mounts. Inground legs offer the most permanent solution with extended legs that are cemented into the ground. For a secure, but changeable solution, the surface mount is the answer. These picnic tables feature legs with predrilled plates allowing them to be secured to an existing cement pad, but can still be removed as needed. Picnic tables are not just for kids. Make your next business lunch more relaxing and go outside and breathe some fresh air. Outdoor communal tables invite people to take a break outside and socialize. Your next company BBQ will be easier to organize when you already have outdoor seating and tables ready for your delicious spread. Surprise employees by holding the next office meeting outdoors to help build office moral. Think of all the inspiration just outside your office door! Worthington Direct has a variety of commercial duty picnic tables. Our most popular style of outdoor picnic tables are the thermo-plastic coated, heavy-duty steel with either punched steel or expanded steel perforation for water drainage. We also offer tables made of pressure treated wood, recycled plastic or all aluminum. 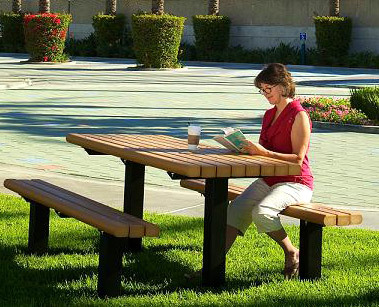 Many Ultraplay picnic tables feature ADA accessible versions so that no person feels left out. 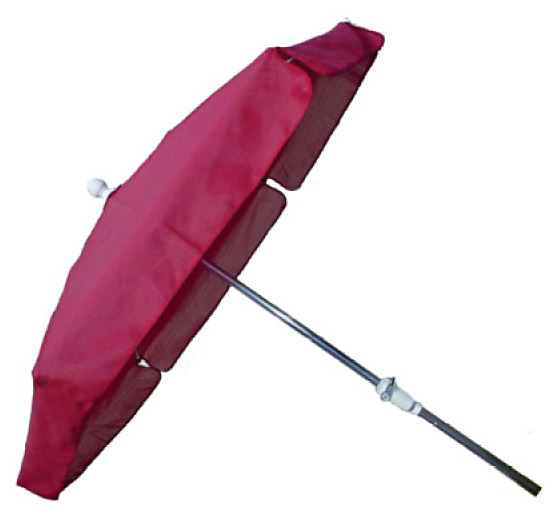 If you need some help with shade, we also carry shade umbrellas and all weather umbrellas perfectly designed for an outdoor picnic table. Accent your picnic tables with outdoor planters and bike racks, and protect your seating areas with bollards in a variety of designs and sizes. Contact us for more information or questions about our picnic tables. We look forward to hearing from you.